Summary: Researchers explore how how body’s natural time keepers work. Ludwig II of Bavaria is a particularly striking example of how differently people’s internal clocks can tick. Historical sources tell us that the monarch usually carried out his government business at night and slept during the day. Whether the “Fairy Tale King” had a disorder that disrupted his sleep-wake rhythm is a matter even Gregor Eichele can only speculate about. Nevertheless, Eichele and his team at the Max Planck Institute for Biophysical Chemistry in Göttingen have gained many new insights into how our body’s natural timekeepers work. “The sleep-wake cycle is intimately linked with our internal clock,” says Gregor Eichele, who heads the Genes and Behaviour Department of the Max Planck Institute in Göttingen. Eichele knows first-hand how the internal clock can affect wellbeing: for many years he commuted regularly between Germany and the USA, and the circadian clock has long been one of his scientific passions. Every day, millions of people experience how their sleep patterns are affected by their internal clock. Nowadays air passengers can cross several time zones within hours. The result is that their internal clock often gets out of synch. Others complain of sleep disturbances when the clocks are turned forward or back by just one hour for summer and winter time. Even in the case of such small adjustments, it can take the internal clock several days to re-synchronize with the environment so that the affected individual is able to sleep again as usual. “Nevertheless, sleep and the internal clock are fundamentally different. Whereas sleep is a function of the body as a whole, the internal clock is a property of individual cells,” Eichele emphasizes. At the same time, the two influence each other. For example, neurons and substances like oxytocin and other sleep-regulating neuropeptides are controlled by the 24-hour circadian clock, which is therefore essential to ensure that we’re able to fall asleep at the right time. The word “circadian” is derived from the Latin circa (approximately) and diem (day). It expresses the fact that the internal clock only approximately keeps a 24-hour rhythm. An individual can have a circadian clock with a rhythm of, say, 24.7 hours. If the person lived for several weeks in a room that is always illuminated, he or she would fall sleep 42 minutes later every day than on the previous day. Environmental conditions – mainly light – act as timekeepers to continuously recalibrate the internal clock to a rhythm of exactly 24 hours. This seemingly complex system exists because the daily day-night cycle is not in itself sufficient to synchronize the biological processes in our body. Consider, for example, the light environment of modern life. If our physiological rhythms were merely a response to the presence or absence of light, any prolonged evening with all its artificial light sources would have catastrophic effects on our metabolism and sleep-wake rhythm. Instead, our internal clock recognizes these external time signals as spurious and keeps the body chronologically stable. The circadian clock probably arose at the very dawn of evolution. The very first single-celled organisms in the primordial seas may have benefited from an ability to predict the sunrise and descend into deeper waters to avoid it. In this way they escaped from the UV radiation of the sun, which at the time was still essentially unfiltered. In the darkness of the deep sea, the clock then signalled to the microbes when it was time to surface again. Once they evolved, virtually all life forms have retained the internal circadian clock movement. It is beneficial for plants to carry out photosynthesis only during the day. In diurnal mammals such as humans, body temperature rises before waking. The release of the stress hormone cortisol peaks in the morning to boost physical and mental performance. Metabolism, muscle tone, renal function and blood metabolite concentrations fluctuate over the course of a day. There is a molecular clock for every cell, every tissue, every organ − whether the liver, kidneys, heart, gut, immune system or skin – and for the body as a whole. “We have a whole shop full of clocks,” says Eichele. Being Swiss, you might say he is predestined to analyze such mechanisms. In order for all the clocks to display the same time, they must be continuously synchronized with the 24-hour light / dark cycle of the environment. The most important clock, the suprachiasmatic nucleus (SCN), is located in the brain. Within this nucleus are 50,000 interlinked neurons that are also connected to neurons in other brain regions. The SCN receives signals through nerve fibres from specialized sensory cells in the eyes. When light strikes a light-sensitive pigment in the sensory cells of the retina, they generate an electrical signal, which is relayed to the SCN. Without the SCN, hamsters, for example, lose their daily rhythm. Scientists have measured this by placing a treadmill in the cage and recording the rotations of the wheel as a measure of the hamsters’ activity. Hamsters are mainly active between sunset and sunrise. Without an SCN, however, they were about as likely to exercise during the day as during the night. Yet the animals did not sleep more than usual. This finding suggests that the nucleus, as the master clock, relays information to all the other clocks in the cells, tissues and organs of the body, and synchronizes them both with the day and with each other. However, this theory has been called into question by recent research: Eichele’s team has modified mice genetically in such a way that the important clock gene Bmal1 is inactive specifically in the SCN. Their experiments differ from the hamster studies in that the connections to and from the nucleus are left intact. According to the theory, the animals’ internal clocks should go haywire. That doesn’t happen! “We’ve found that the other circadian clocks remain synchronized even without the master clock in the SCN,” Eichele explains – at least under the condition that light and dark alternate in a 24-hour rhythm. Chaos ensues, however, if mice lacking the SCN clock are kept in permanent darkness. They then have problems keeping their other internal clocks in synch. The body therefore needs the natural light-dark cycle as a timekeeper. Although food intake can calibrate the circadian clock to a precise 24-hour rhythm, this results in only semi-synchronized internal clocks. Evidently, the clock system is organized like a federal country that is able to keep the individual regional governments running even if the federal government sometimes grows weak. “This system is ultimately more stable than one that relies exclusively on the SCN,” Eichele says. But how do internal clocks synchronize without the master pacemaker in the brain? One possibility is that the body’s clocks receive light/dark information from the SCN. Researchers have shown that light can activate clock genes in organs such as the liver via the autonomous nervous system. If the nucleus is absent, light signals travelling from the eyes into the body also peter out. Light then no longer has an effect on the autonomous nervous system or the body’s clocks. Since the scientists from Göttingen only switch off a single clock gene and not the entire neural nucleus, light signals are still able to reach and synchronize the other clocks in the body via the nucleus. Evidently, the signals do not have to be pre-processed in the clock cells of the nucleus. It is also possible, however, that other important clocks in the brain stand in for the SCN and synchronize the body’s clocks. A likely candidate would be the pituitary gland, which also receives light signals from the eyes. Located at the base of the brain, the gland releases the hormone ACTH into the bloodstream, which is then transported to the adrenal glands, where it triggers the release of cortisol, adrenalin and noradrenalin. These stress hormones are known to be important pacemakers for the internal clocks of peripheral organs. Eichele and his team have discovered that mice with a defective SCN clock rhythmically release the hormone corticosterone in the course of the day in synch with other body clocks – almost as in normal mice. This hormone is analogous to cortisol in humans. “It’s possible that corticosterone synchronizes the body’s clocks if the SCN fails as a timekeeper,” Eichele concludes. This suggests that the internal clock in the adrenal glands is almost as important as the clock in the SCN. Moreover, the clocks in the body’s tissues and organs are influenced not only by light but also by sleep. “You have to be relaxed, free of stress and able to sleep when you want, meaning in accordance with one’s personal chronotype, which determines whether you go to bed early or late and tend to sleep for short or long periods,” says Henrik Oster of the University of Lübeck, who headed a research group at the Max Planck Institute in Göttingen until the end of 2012. Since Oster’s time in Göttingen, he and his colleagues have been studying the relationships between sleep, the internal clock and metabolism. They have observed, for example, that the liver and fat cells of mice with sleep disorders no longer operate in sync. The researchers want to determine if the rhythm of the cells of other organs, such as the kidneys, is also decoupled. A lot of evidence also suggests that sleep disorders can also alter metabolism via the internal clock. For example, Oster and his colleagues at the Max Planck Institute altered the normal sleep rhythm of mice, thus compromising their internal clocks. They prevented the mice from sleeping in the morning by placing toys in their cages. After a few days, they found that the disrupted sleep pattern had an impact on the internal clocks of peripheral organs, which were then no longer able to switch important metabolic genes on and off. One target of such a metabolic disturbance is hormone-sensitive lipase. Normally the circadian system ensures that this adipocyte enzyme is active during the sleep phase. It then breaks down stored fats, which the body needs to bridge this period without food. However, because lipase activity is lower in sleep disorders, little fat is released into the body. “Because blood glucose levels fall in these circumstances, the result is an energy emergency. The animals get hungry,” Oster says. The mice start to eat, which then further disrupts their sleep patterns. The result is a vicious circle that causes the animals to gain more and more weight. To complicate matters, hormones in the stomach reset the liver’s clock if the mice eat when they should actually be asleep. Consequently, the liver’s metabolism becomes increasingly imbalanced. The Lübeck-based researchers have also observed that clock genes regulate metabolic changes in sleep-deprived humans. Whether that really can lead to obesity and diabetes has not been established. However, studies on shift workers also point in that direction. Sleep and the internal clock are closely associated with each other: if the internal clock gets out of synch, sleep problems can develop. And individuals who sleep poorly or irregularly disrupt their internal clock. Cells and organs also follow their own internal clock. The suprachiasmatic nucleus, a cluster of neurons in the brain, is the master pacemaker for other clocks in the body. However, the latter can also function without the nucleus. Some of them receive light/dark information directly from the eyes. Sleep defects can trigger metabolic disorders by altering the activity of clock genes, thereby disrupting downstream metabolic processes. 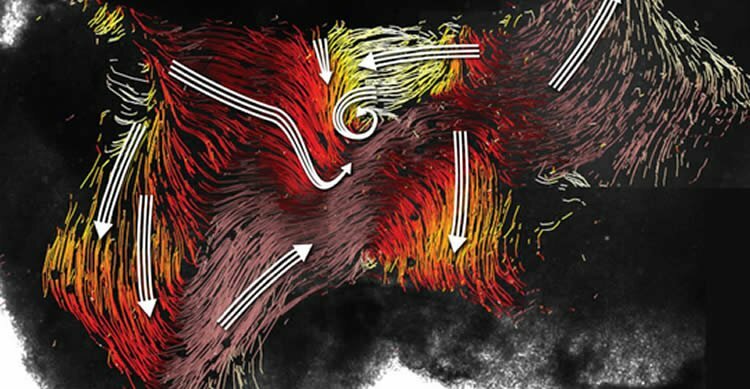 Image Source: NeuroscienceNews.com images are credited to MPI for Biophysical Chemistry / Regina Faubel / Hartmut Sebesse / Boettcher-Gajewsk.